During the Christmas season we are reminded of the birth of Jesus. The news of Jesus’ birth surely brought Joy to the World. Yes, Jesus humbly gave up his divine prerogatives to live with us, suffer with us, and die for us – out of his great love for us. Jesus was “Born that man no more may die,” that through faith in him we might have everlasting life with him in Paradise (John 3:16). Jesus was “Born to raise the sons of earth,” that we might become children of God and heirs together with Christ in heaven (Rom. 8:17). Jesus was “Born to give them second birth,” that we might be born again – a spiritual birth – so that we might be transformed into his likeness (2 Cor. 3:18). Jesus has given us a fresh start! Adam and Eve failed in the Garden of Eden and they were expelled from Paradise. Jesus, the last Adam, has succeeded and is bringing us into Paradise! Jesus’ birth was a game-changer – for all of us. His birth is still recognized in our calendars, in this Year of our Lord, 2016. 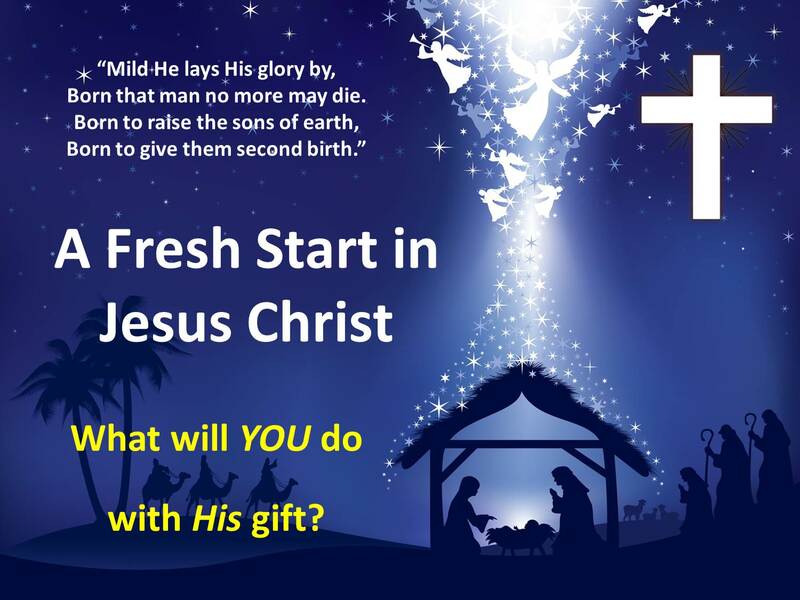 Jesus came to give us new life and a fresh start. But we have a choice: Will we accept his freely-given gift or will we continue to live our lives our own way – a way which leads to destruction? Moreover, having received Jesus’ gift of eternal life, will we live our lives as Jesus would, or will we take his gift for granted? The choice is ours. May we all choose better than Adam and Eve. This entry was posted in Uncategorized and tagged 1 Corinthians 15:45, 2 Corinthians 3:18, born again, Christmas, Christmas carol, divinity, Emmanuel, eternal life, Hark the Herald Angels Sing, humility, Jesus Christ, John3:16, Joy to the World, last Adam, Messiah, nativity, redemption, regeneration, renewal, Romans 8:17, salvation, Savior, second birth, spiritual birth on January 11, 2016 by BrotherWatch. In Matthew 10:34, Jesus made a seemingly enigmatic statement: “Do not suppose that I have come to bring peace to the earth, but a sword.” Jesus graphically depicted how differing views of Jesus would divide people. The contrast between views could not be starker between the Left and the Right. One party removed God from its 2012 platform while the other is derided by the Left for its embrace of the Religious Right. As usual, Jesus is the pivot point, the demarcation line, or, as He put it, the sword which divides. Jesus is either a rock of offense or the foundation of one’s faith. The head of the Democrat Party, President Obama, views Jesus as a dead social justice activist, while President Reagan, the model for most Republican candidates, viewed Jesus as both alive and divine. Actually, no. Christmas is about worshiping the newborn Babe and risen King. While people of all faiths can certainly enjoy this festive time of year, and Americans of all faiths should certainly strive for peace and harmony, only one faith – and, in particular, one Person – is the reason for the season. God blessed America because people of the Christian faith sought His will in establishing this great nation. Our political, cultural and spiritual heritage is distinctly Christian in nature. 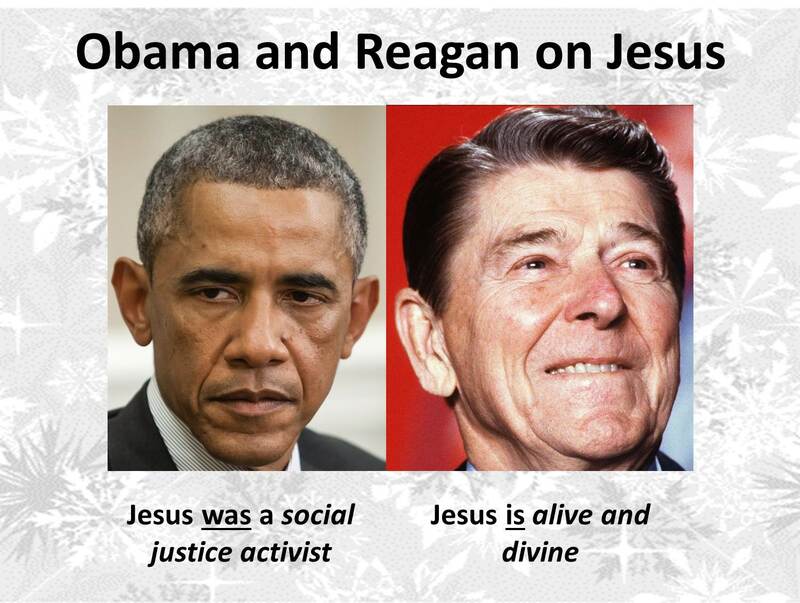 In contrast to Obama’s view of Jesus as a dead social justice activist, Reagan viewed Jesus as both alive and divine. See “Attacking the Faith: Did Jesus Say that He is God?” at http://wp.me/p4scHf-P.
 See “Celebrating Christmas” at http://wp.me/p4scHf-ct.
 See “Jesus, the Prince of Peace,” at http://wp.me/p4scHf-6J. See “Not a Dickens Christmas” at http://wp.me/p4scHf-cq. This entry was posted in Uncategorized and tagged Barack Obama, Child, Christian heritage, Christmas, divine Creator, Emmanuel, George Washington, God with us, Good News, gospel, hope, Jesus, John 3:16, manger, nativity, Prince of Peace, reason for the season, Ronald Reagan, salvation, social justice activist on December 29, 2015 by BrotherWatch. 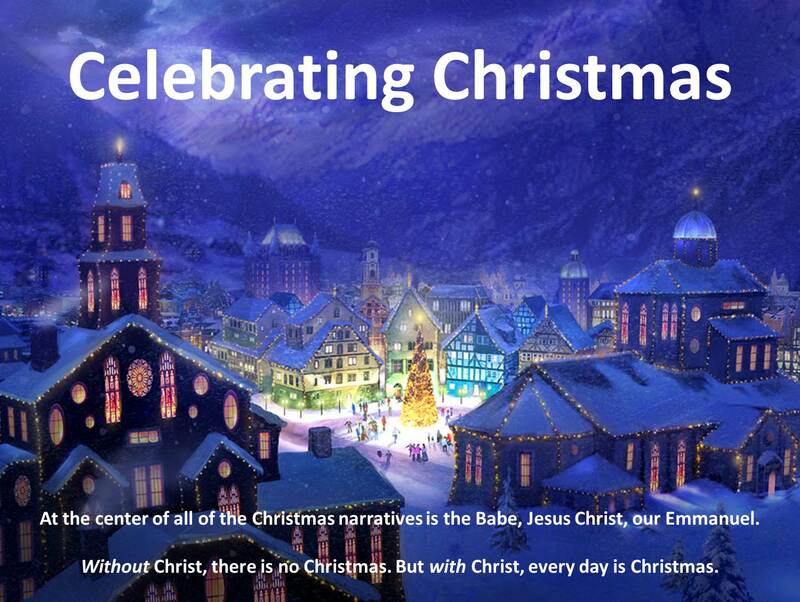 At the center of all of the Christmas narratives is the Babe, Jesus Christ, our Emmanuel (“God with us”). With the birth of Jesus, mankind was introduced to God in the flesh, One who could fully empathize with us and who, now, intercedes on our behalf with our Father in heaven. Why would God want to share His life with us? The apostle John added, “truly our fellowship is with the Father and with His Son Jesus Christ. And these things we write to you that your joy may be full” (1 John 1:3-4). The exquisitely joyous Christmas season reminds us of our fellowship with God in Christ, a relationship which should fill us with joy. Every day. And, when we meet our Maker, we will fully experience joy forevermore. John also revealed a little bit about that time, writing, “Beloved, now we are children of God; and it has not yet been revealed what we shall be, but we know that when He is revealed, we shall be like Him, for we shall see Him as He is” (1 John 3:2). Jesus became a human being so that, ultimately, we could might experience spiritual rebirth and be transformed into His image, to become like Him! 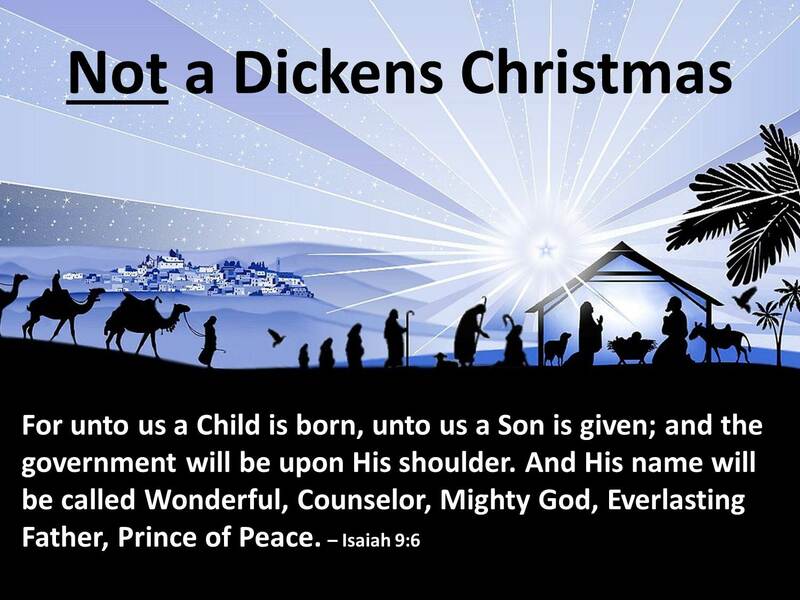 These are just a few things to ponder as we celebrate the day of Jesus’ birth. Without Christ, there is no Christmas. But with Christ, every day is Christmas. This entry was posted in Uncategorized and tagged 1 John 1:3-4, 1 John 3:2, Advent, Babe, Child, children of God, Christ, Christmas, Emmanuel, fellowship, God with us, Good News, gospel, hope, Jesus, John 1:10, John 1:14, John 3:16, manger, nativity, reason for the season, salvation on December 23, 2015 by BrotherWatch. Charles Dickens’ A Christmas Carol is a popular, perennial tale which captures the imagination, tugs at our heartstrings, and, sadly, misses the whole point of Christmas. Every year, new Christmas movies are released, destined to garner good ratings. Many are romantic comedy/dramas. Others address family or financial issues. Some are simply fun. And many explore the Dickensian themes of economic disparity and evil elites. “Dickens was a Unitarian” who “focused more on morality and ethics than on traditional theology,” and whose “own faith seemed to be more of a romantic, deistic, Unitarian variety.” In fact, today he would be called a social justice warrior. “Benevolence, rather than faith, is central to Dickens’s vision of the Christmas.” Hence, his harangue against the stereotypical greedy capitalist. In the end, Scrooge promises to honor Christmas as his path to redemption. This is idolatry and a false gospel. Like those pagans condemned in Romans 1:25 because they “worshiped and served created things rather than the Creator,” Scrooge is worshiping Christmas instead of the Babe who was born on Christmas. But Christmas is a joyous season for one reason: Jesus Christ was born that we might be redeemed by Him and live with Him through eternity. 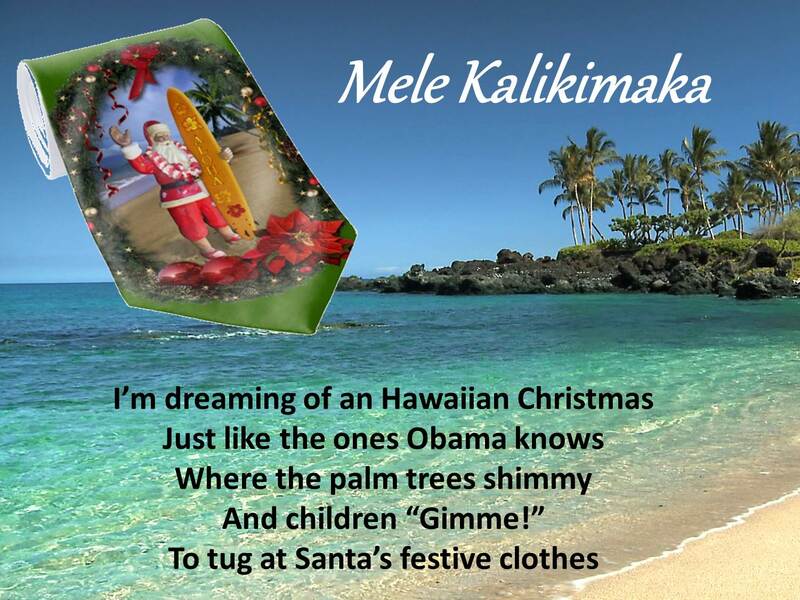 Virtually all traditional Christmas songs celebrate this sublime truth. Remember, Christ, our Saviour / Was born on Christmas day / To save us all from Satan’s power / When we were gone astray. / O tidings of comfort and joy, / Comfort and joy. / O tidings of comfort and joy. Don’t neglect the reason for the season. As you celebrate the birth of Jesus, spend time with the One whose birth we are celebrating. This entry was posted in Uncategorized and tagged Child, Christmas, Counselor, Emmanuel, Everlasting Father, God Rest Ye Merry Gentlemen, God with us, Good News, gospel, hope, Isaiah 9:6, Jesus, manger, Mighty God, nativity, Prince of Peace, reason for the season, Romans 1:25, salvation, Wonderful on December 23, 2015 by BrotherWatch. Christmas is indisputably the most joyous season of the year. For many Americans, 2015 will prove especially memorable. Regardless of the weather wherever you are, may we all remember the reason for the season. This entry was posted in Uncategorized and tagged Christmas, climate change, Emmanuel, global warming, God with us, Good News, gospel, hope, Jesus, Joy to the World, Luke 2:10, Luke 2:14, Messiah, Obama, peace, salvation, Savior on December 23, 2015 by BrotherWatch. The real meaning of Christmas can often be obscured by the trees and lights, the fanfare and the presents. But Christmas is not about the glitter – as festive as that can be – but about the glory of God revealed in Jesus Christ, who was born as a Babe to bring hope to the world. For God so loved the world … that the Word clothed himself in humanity to dwell with us. 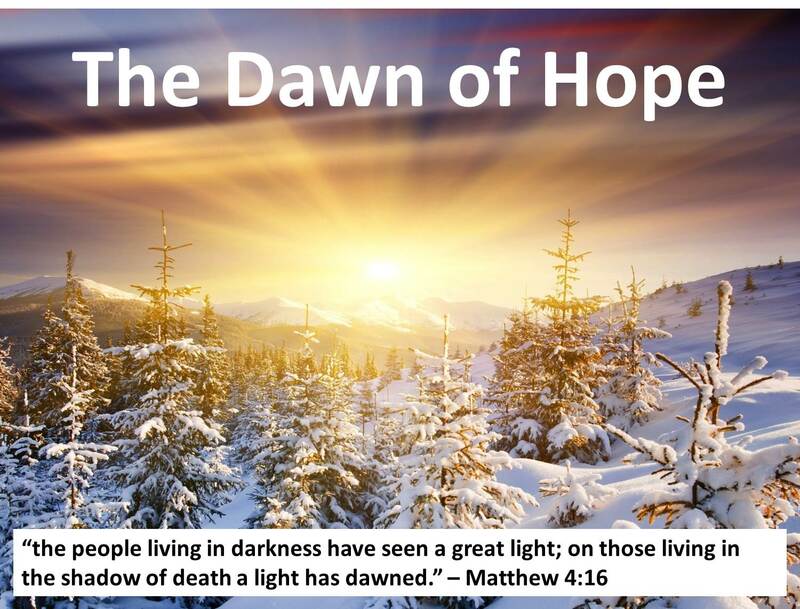 Jesus entered our darkened world to bring us the Light that we might have the hope of salvation in him. 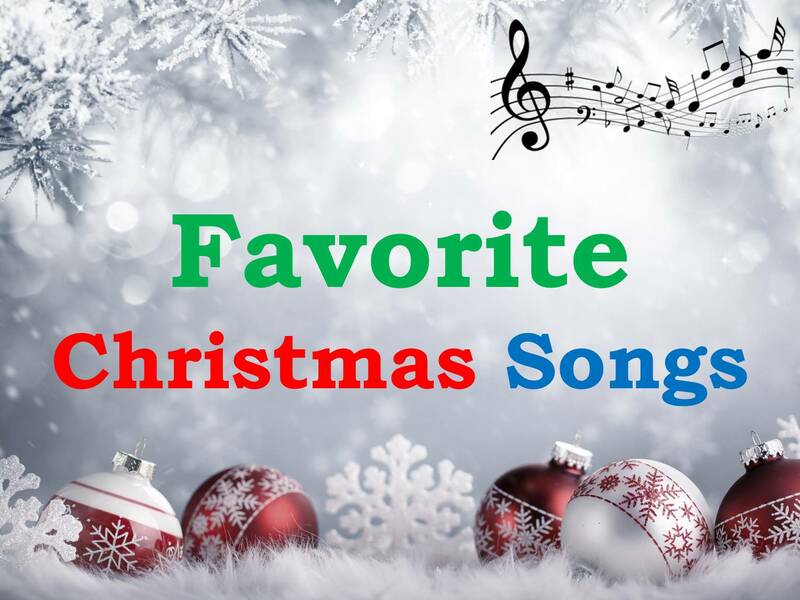 Christmas is a joyous season with joyful and festive songs – with good reason! Jesus was born to save his people from their sins and to bring us into a relationship with the Father, Son, and Spirit that will continue through eternity. The Good News of Jesus arrived that Christmas day, with angels and shepherds and wise men witnessing the miracle and worshiping the Messiah. Joyful adoration erupted from hearts filled with hope that God would fulfill his promises. Jesus was born in a dying world and we, 2,000 years later, live in a darkened world. But Jesus, our Light, gives us a certain hope for the future – a hope that we can share with others. Jesus, our Emmanuel – God with us – is indeed with us so that we have nothing to fear. This Christmas season (and throughout the coming year), may we express the love and exhibit the hope that Jesus has given us to those still in the darkness, pointing them to the true meaning of Christmas. This entry was posted in Uncategorized and tagged Christmas, dawn, Emmanuel, God with us, Good News, gospel, hope, Jesus, Light, Matthew 4:16, Messiah, peace, salvation on December 14, 2015 by BrotherWatch.